Even a single missing tooth can spell big trouble for your appearance and oral health, and those problems only compound as more teeth go missing. If you’re ready to rebuild your smile and reclaim your confidence, you’ll find everything you need here at Advanced Dental Care. Dr. Jorgenson and Dr. Yang are able to provide a wide selection of replacements that can bring back any number of teeth for a lifetime to come, and they can design a treatment just for you. To learn more about your options, contact us today. Why Choose Advanced Dental Care for Replacing Missing Teeth? Dental bridges can be used to replace one or more missing teeth in a row, and they rely on the strength of your remaining teeth for support. Dental crowns are placed on either side of the absent teeth, and these are used to hold the new prosthetic teeth in place. Bridges not only help someone regain their natural appearance, but they also restore normal chewing function. Additionally, they prevent the neighboring teeth from shifting out of place. Whether you need to restore just a few teeth or an entire arch, Dr. Jorgenson can help. You can finally have a full smile again with a partial or full denture. 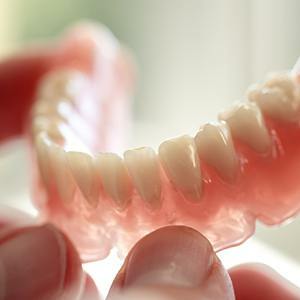 A partial denture replaces a few missing teeth and is held in place by clips or brackets. A full denture replaces an entire upper or lower arch and is often held in place by an over-the-counter adhesive. Dental implants are able to accomplish something literally no other treatment can: replace an entire tooth. 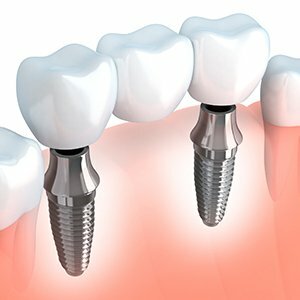 While traditional bridges and dentures only bring back the crown of a tooth, implants also restore the root using a small titanium post placed into the jaw. This two-part construction makes implants extremely stable, natural-looking, and durable all at the same time, helping patients finally close any annoying gaps for good. 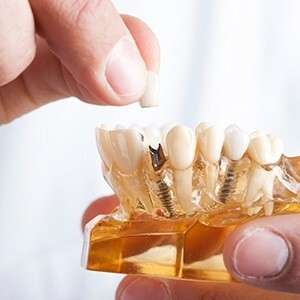 And, unlike other practices in Costa Mesa, patients can complete the entire implant process here at Advanced Dental Care to help them save time and money.